As a young girl growing up, I thought all women sewed. I thought that you got up in the morning, brushed your teeth, combed your hair, and sewed. What stirred this belief? My mother! I like to tell people that I grew up under my mother’s sewing machine. I was born in Germany and my family immigrated to Canada just before I turned 8. As a way to stay home with my sister and I my mom took in alterations, but when she wasn’t ‘working’, ie sewing at the machine on other peoples clothes, she was stitching on needlepoint, cross-stitch, knitting, crocheting, sewing beautiful clothes embellished with appliqué and stitchery. In short, I rarely saw my mother without some form of handwork. She worked with purpose, with intention; putting part of herself into the things that she made. She was ‘Slow Stitching ‘ long before the words were put together to explain this movement. I don’t ever remember being taught or learning to sew; I simply did. I wanted to sew clothes for my dolls, so I picked scraps from the sewing room, needle and thread, and sewed. As I grew older I simply chose to use a sewing machine. I crocheted and did needlepoint, I knit and stitched, and learned by example and osmosis. By the time I was a teenager, I sewed many of my own clothes. Unlike many girls my age, instead of buying make-up or music, I spent all my money on fabric. Prom coming up? Not a problem, the dresses were usually sewn a night or two before. I never thought of buying dresses, I bought patterns instead, and fabric. During another major move in my life at the age of 14, my family moved to a camp/resort, where many of the beds had handmade quilts and bedcovers. There I discovered a beautiful Grandmother’s fan coverlet. I promptly started searching out fabrics from the scrap box and old clothes that could be cut up. I pulled apart an old sketchpad to make thick templates to trace around and I sketched out a plan. This was to be my ‘seven year quilt’. Not 7 years because that’s how long it took me, but 7 years because I worked on it every seven years. Started when I was 14, worked on it again when I was 21 and newly married, again at 28 with two small toddlers in the house, and completed when I was 35 and now guild president and firmly entrenched in quilting. As I mentioned I had sewn all my life, but it wasn’t until I moved to Kamloops in 1988 that I learned that part of what I had been doing was called ‘quilting’. My first large quilt was King sized and hand pieced and quilted. After years spent working in banking, a job I did very well, but one that did not nourish my soul, I began searching for something else to do. Even during those years I’d spend lunch hours and coffee breaks hand sewing hundreds of Christmas ornaments to sell at local craft fairs and through private contacts. In 1995 Kamloops lost the only remaining option for quilting fabric, it took me until 1999 to gather the courage to jump in and open my shop. Very soon after I opened the shop I started to design quilts for in-house kits and Block-of-the-Month Programs. My aim has always been to encourage my customers to take those designs, play with them and to make them their own. Sometime over the years I became obsessed with hexagons. My Pinterest board ‘Hexagons have put a Hex on me’ alone has over 1,000 pins. Designing inside the hexagon, treating the hexagon like a block in a quilt instead of just a unit became a goal. By 2012 I was ready to launch my Block-a-Week Hex-a-thon; these blocks later turned into ‘The New Hexagon – 52 Blocks to English Paper Piece’ published by Martingale in October of 2014. Although I wanted to streamline the English Paper Piecing process to make it more accessible to many more quilters by glue basting the fabric to the paper templates, I also wanted to share with more quilters how fulfilling the process is. EPP requires few supplies and is extremely portable making it the perfect project for everyone from young moms sitting waiting at piano lessons, hockey games or doctors appointments, to snowbirds on the road travelling south for the winter. When the publication of my book was approaching, I re-read Martingale’s Author Handbook and took to heart the section about their expectations that the author help to promote their book. I almost panicked, thinking I don’t blog or travel to teach, being tied to my own store, so I gave considerable thought to how to do this. During the writing of the book many other ideas came to me for different ways to use the blocks I had designed and then I received a Kaffee Fassett fabric called ‘Millefiore’. I loved this fabric and looked up the definition of the word Millefiore, finding it described the art of Glass caning, fusing canes of glass together and crosscutting them, then embedding them in clear glass to make often-kaleidoscopic designs. 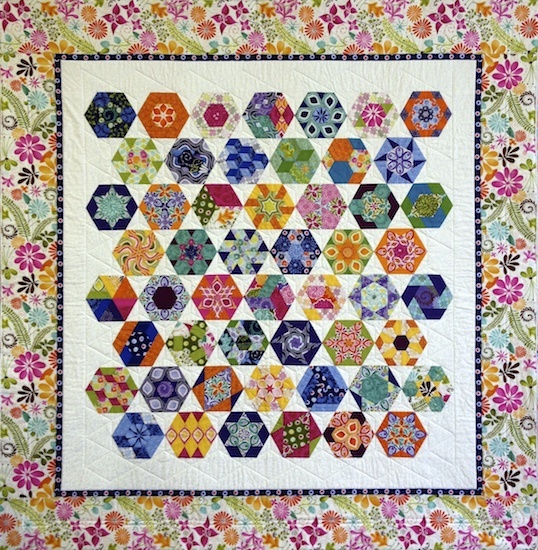 I knew then that I wanted to create this look with fabric, specifically using the blocks in my book in a totally different way than I had done in the book itself to create ‘The New Hexagon – Millefiore Quilt-Along’ on my website. I wanted to reward those that had purchased my book by creating a FREE online quilt-along. I announced this launch on the Martingale Stitch This Blog in October of 2014 and also on my store Facebook page. Right from the start I received some pretty positive feedback. I posted on Instagram and Facebook and those posts were shared and re-shared. As the anticipated start date of January 1st /2015 approached the number of registered participants climbed higher and higher. I had interest from several businesses to run it as programs in their stores. 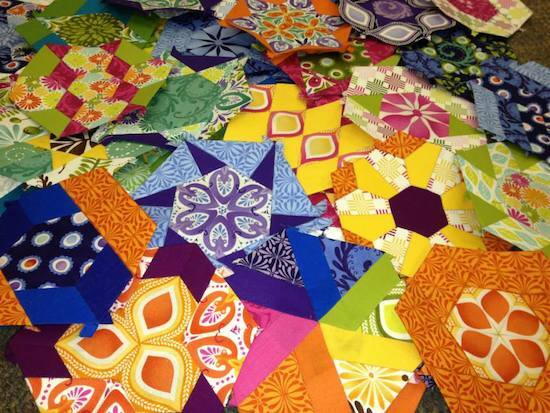 Several days into January I had received many request to start a ‘The New Hexagon – Millefiore Quilt-Along’ FaceBook group page for participants to share photos and interact. Within 24 hours of starting that group page we had well over 300 members, as of this writing we are up over 2800. What exactly makes this project about Slow Stitching? Yes, it’s about hand sewing, but that doesn’t make it slow stitching in and of itself. It is the interaction of the participants and the support and advice they give each other, it is choices of fabrics made with intention to create something lasting and representative of self, it is struggling not only about fabric placement, but personal changes in the design and the techniques used to satisfy oneself. I have put My heart and soul into this project. Not only have I developed a wonderful following of other hexagon addicted devotees, but also I have created a mini-movement that follows ‘The Slow Stitching Movement’ ideals. I as well as the 2800 or so stitching along are creating a true legacy quilt that will one day define us at this point in our lives. We are putting our blood, sweat and tears into this project, and perhaps a bit of our souls as we grow to love ‘our Millies’ more each and every day, fabric by fabric, stitch by stitch. 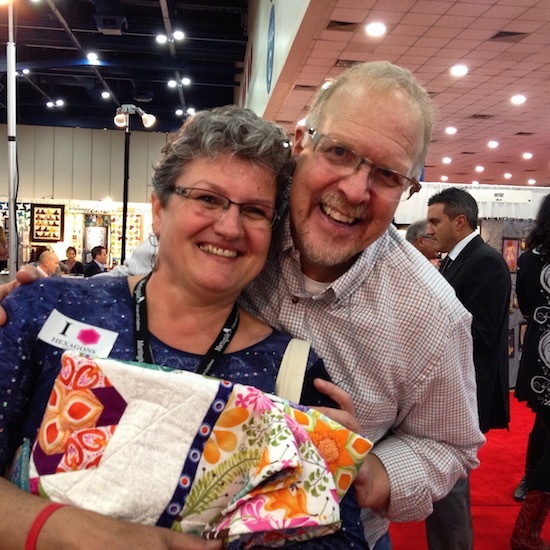 During a recent trade show, I had a women tell me she had lost her brother about a month previously and it wasn’t until she discovered my design and ‘The New Hexagon – Millefiore Quilt-Along’ online that she once again found a reason to get out of bed in the morning. My heart cried for her, but I was grateful that I was able to touch her and all the others who have jumped on board with me. And my mom??? She still sews, knits and cross-stitches daily. It is rare to see her without work in her hands. Once a week she comes in to the store with me and inspires others with her meticulous works created with focus and intention. Katja Marek was born in Moers, Germany. At the age of eight, she immigrated with her family to Canada. Her mother was a tailor by trade and took in alterations as a way to stay home with her children. Katja grew up under her mother’s sewing machine, and spent many childhood hours crafting, sewing, crocheting, and cross-stitching. Unlike most teenage girls, Katja spent her money not on makeup and music, but on fabric. When she was 14, the family moved to a camp/resort, where many of the cabin beds featured handmade quilts. Katja fell in love with an old version of a Grandmother’s Fan design. 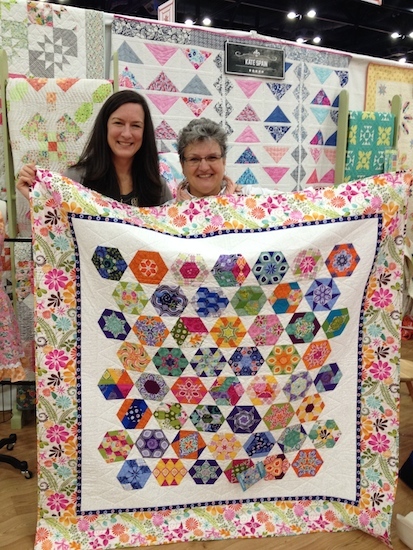 Without any knowledge of quilting, but with a vast knowledge of sewing, she proceeded to make templates and cut pieces from old clothing–and thus her quilting journey began. Winning the award for art achievement in high school convinced her that she wanted to pursue a career with a creative outlet. In 1999, with years of banking behind her and her children in their teens, the time had come for Katja to realize that dream. 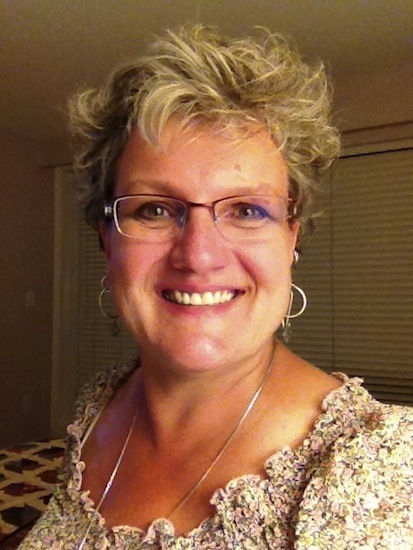 She fulfilled her vision by opening her own quilt shop in Kamloops, British Columbia. My goodness . . . Who’s this handsome specimen of man? 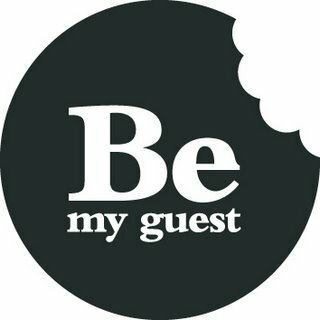 We would love for you to share your creative process, thoughts, feelings and your place in The Slow Stitching Movement. He will email you the simple guidelines for posting your own blog here and introducing yourself to the world of Slow Stitchers! Katja Marek, I love what you do to Hexies (and the other Gons)!